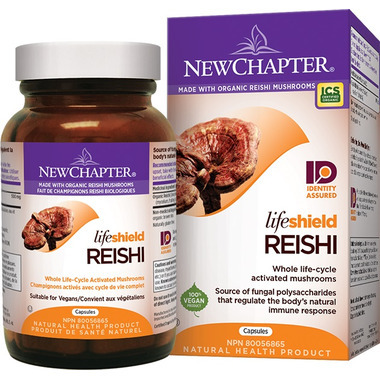 New Chapter LifeShield Reishi delivers tonic mushrooms’ whole protective shield through the combination of mycelium, fruiting bodies, spores, and their extracellular compounds. Each stage of a mushroom’s life cycle adds critical nutrients and protection for the mushroom. The combination of these stages creates the activated LifeShield to promote your health and wellness. New Chapter uses state-of-the-science technologies to match, verify and guarantee each and every mushroom strain. This includes identification through mushroom DNA testing. 100% USA-GROWN & NATURALLY GLUTEN FREE. 100% Vegan.